As an active member of Leadership Las Vegas, Spencer Fane attorney Mary Bacon is helping make a difference in lives of local schoolchildren. 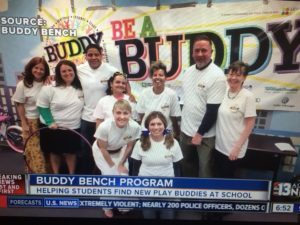 Mary’s Leadership Las Vegas class is placing Buddy Benches at 10 schools in the Clark County School District to help reduce bullying and integrate students. A Buddy Bench is a place on the playground where kids can go when they are looking for a friend. Before the Buddy Bench is presented to the school, Leadership Las Vegas members conduct a skit at a school assembly to help explain how it works. When students see someone on a Buddy Bench, the students invite them to play with them. It’s a helpful reminder to be kind and always make friends. The program was recently featured on Las Vegas Channel 13 News. You can view the video of the interview here. Leadership Las Vegas is the premier community leadership building program in Southern Nevada, designed for executives and accomplished professionals from a wide range of industries who want to make a positive impact on the community. Through the 10-month program, class members develop a deeper understanding of the region, its challenges and opportunities, in order to become more effective leaders and change agents.